Before we start any discussion all the friends prayed for the Magfarat of Engr. Pervez Randhawa and Engr. Syed Abrar Ali’s mother who passed away recently one in San Francisco USA and the other in Karachi. May ALMIGHTY rest their soul in rest and peace and shower His Blessing on them and forgive all their sins and accept the good deeds and grant them good place in Jannah, Ameen. Engr. Syed Abrar Ali-Electrical, Engr. Tariq Said Bukhari-Electrical, Engr. Shahid Hafiz Mirza-Electrical and Engr. Wizarat Ali Khan-Mechanical could not attend as Abrar was very busy and Tariq and Wizarat were suddenly got sick and could not come while Shahid promised but could not come due to some family commitment. During the discussion it was mentioned that there are three NED69ers who were meeting each other after forty five years. It was a great pleasure meeting old buddies after such a long time. 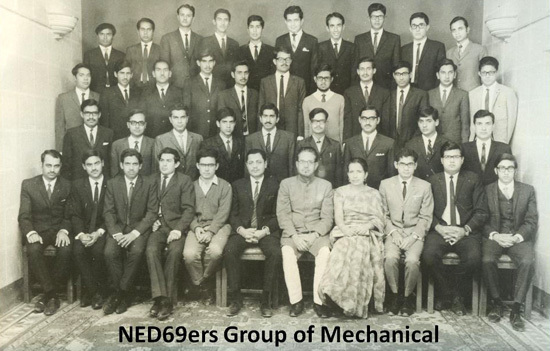 We all enjoyed reviving the sweet old memories of NED Government Engineering College at Burns Road Karachi and Sewakunj and Metha Ram Hostels. We all missed the Waheed Kabab House and Dil Bahar Lasi and all the Chats of Burns Road. When so many old buddies meet after such a long time it is so much of fun that very difficult to explain. 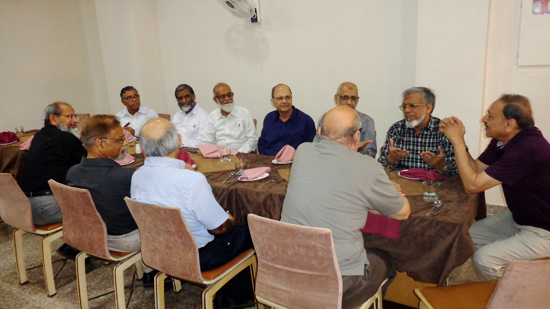 During the discussion all the friends living in Karachi insisted that we do not have to wait for friends to come from abroad so that we meet, we should make it a point that we meet either every month or every other month at any decided place without fail. Life is very short and as most of us are retired so we must meet so that we know each other welfare and on meeting discuss about the life we spend after leaving the college. All the friends complained to Ghulam Shabbir Chishtey about becoming the host, he explained that I came to Karachi and I have to visit Hyderabad to see my brother so there was not much time to meet so many friend at one time. So instead of calling and the party to be arranged it would have taken much time and I do not have that with me. So I decided to arrange everything and invite you all so that you do not have any excuse and you have to come. Anyway it was real fun meeting and greeting each other at one pace and time. Engr. Sharif Ur Rehman Malik was the organizer and selected the menu. The food was very delicious and the service was great. The hot “nans”, “Nihari” and Sekh Kabas were the hits of the menu. The most important thing was that there was not much rush like some place where you cannot enjoy the food and cannot even talk. We all thank Engr. Ghulam Shabbir Chishtey for the dinner and wish him a safe journey back home.